In Part Three, Nancy Fichtman Dana, Sally J. Zepeda, Jeffrey Wilhelm, James "Jimi" Cannon, Andrew Miller, Catherine Beck, Judy Bell and Pia Lindquist Wong offered their suggestions. This series is wrapping-up with responses from PJ Caposey, Laura Robb, Dr. Barbara Blackburn, Pete Hall, Fred Ende, Emily Phillips Galloway, Paola Uccelli, Nonie K. Lesaux, and Meredith Allen. I've also included responses from readers. Whether it is Marzano, Danielson, or some hybrid model - most districts evaluate their teachers' instruction using a thorough and rigorous rubric. The issue with professional development is that almost all training provided by districts would fail to meet the standards of instruction, personalization, and engagement they hold their teachers to in the classroom. Think about it - the level of professional development provided to teachers is traditionally at a lower standard than the current instruction typically delivered by the very people receiving the training. This is at the least ironic and at the extreme hypocritical. The core issue is simple - providing high quality, engaging, and meaningful professional development is hard. I say this with both my PD provider hat on with my superintendent hat. The world of professional development has many problems - I will just explore just two to provide context. Imagine going to the finest basketball camp in the world and being explained the perfect technique for the jump shot. You will receive instruction from an expert coach on how to complete every element of the jump shot; however, you will not be in a gym. Not only will you be outside of a gym, but you will have no ball to practice with and there will not be a hoop in sight. The hope is that you take the techniques you learned in isolation, and then on your own time, incorporate them in to your regular practice. Tough sell! If I advertised this as a basketball camp - literally nobody would sign up. It simply does not make sense to expect this type of complex work to translate from the theoretical to the practical after a few short hours of instruction. Yet, this is our traditional professional development model. Not only is this frustrating to teachers - but as a PD provider it is also frustrating. Most of us are truly more interested in making a difference than trying to make a buck. Both as a provider and a Superintendent, I hope that the PD I provide meets 50 percent of attendees where they are currently at. The gap between what is provided and what an individual needs can exist for a myriad of reasons ranging from personal capacity to personal engagement to struggles at home. There are so many personal variables to account for and PD is generally so expensive that it makes systematic personalization difficult under traditional PD models. In simply exploring two of the major issues with the traditional PD models many issues are exposed. Below, I will highlight a few suggestions moving forward that could transform traditional PD practices into a system that better meets the needs of our teachers. So, the question that bears itself worth considering after reading the above is can professional development for teachers be meaningful if they are not instantly using the new techniques learned to serve kids and also being provided instantaneous feedback? If you are saying no - then it sounds like the PD you prefer fits the instructional coaching model. And that, unlike most PD has a research base that indicates improved outcomes for kids. The EdCamp phenomenon has swept the nation for Twitter-aficionados. That (unfortunately) means most of your staff have still never heard of it. The premise is clear, however. PD provided for practitioners by practitioners that involves choice and hands on activities is a great way to provide PD. What is best is that there is enough expertise in every district to make this a worthwhile (and cost effective) endeavor. PD works when clear goals are established, there is personal commitment, and some semblance of accountability. This means that for PD to take hold, building leaders need to invest in the process and more importantly, invest in their teachers. For personalization to occur, both leadership (and more importantly) the teacher need to know what direction they need to head to move their individual Point A to their individual Point B and individualized support must be provided along the way. The traditional PD model works when used intentionally. The example of the jump shot being taught without a ball or a hoop - could be effective if the coach would then worked through that process, using the same vernacular, every day for the next several weeks with their players. If PD is used as an introductory, skill-building or defining event, which principals and building leaders will then use to have focused conversations for the foreseeable future it definitively serves a purpose. The challenge is for leaders to use PD to start a conversation, not assume it is going to provide a solution. It's no secret--the research of Linda Darling Hammond, Richard Allington, and the National Education Association agree that professional development for teachers significantly impacts students' learning. And students' learning is what education is all about! Traditional avenues for teachers to enhance their teaching practices and instructional toolkit are shrinking. Gone are schools' funding to send several teachers to national and state conferences. Gone are the days when school budgets could hire a consultant for long term professional development. Gone are the days when schools annually purchase several professional books for staff to study and discuss. If teachers make the difference in children's learning and progress, the big question is, How can we create ongoing, cost-effective, professional study? To answer that question, you'll need to think out of the box and develop a professional development strategy that works at the building level. Actually, this local focus makes perfect sense since schools serve different populations and develop diverse cultures. Most of us have patiently suffered through those one-size-fits-all professional study days where the content presented was a total mismatch to our needs. Think of PD as being similar to a teacher-student conference that attends to a student's specific needs. Ongoing professional study at the building level addresses students' needs, takes into account the time teachers have to collaborate and learn, and the funds schools can supply. Even with limited funding, you can still have PD with authors you revere by listening to them on video clips on Youtube or purchasing one of their staff development DVD's and studying it with colleagues. PD is changing. You can wish for the good old days or you can mull over the ten takeaways that follow. Think of them as a menu that offers your school choices. Remember to start small and try one suggestion at a time, gradually adding ideas until your school can juggle several professional learning opportunities during the year. All the time, you'll be building a culture of collaboration and commitment to professional learning. The ten takeaways work best when administrators collaborate with teachers to create a professional study culture that improves instruction and moves students forward. Make the focus of all PD learning focuses on creating classroom practices that foster twenty-first century learning's the five C's: collaboration, communication, creativity, critical thinking, and choice. 1. Change the Focus of Faculty and Department Meetings. Steer faculty meetings away from scheduling and administrative details (these can be conveyed in an email) to inviting teachers to learn in ways students need to learn. Organize staff into groups of five to six and have them discuss a professional article, blog, chapter from a professional book, or watch a Tedtalk. Here's the question to always consider and discuss: How does this information affect my teaching practices? 2. Initiate Google Docs Conversations. Administrators, librarians, or teachers can post a professional article and invite everyone to read it and then share questions and responses. The beauty of this PD is that within the time frame negotiated for responding, teachers can complete this task when it's convenient for them. And because we are social animals who love discussions and sharing ideas, the principal can then have teachers discuss their reactions at department or full faculty meetings. 3. Pair-Up With Colleagues. Choose a like-minded partner and agree to observe one another's lessons, and then have professional conversations about teaching practices and students. Look carefully, listen, and circulate among students to gage their reactions to the lesson. Make sure you and your partner meet to debrief and discuss what worked, what you learned, and what can be tweaked. 4. Read and Discuss in Groups. Empower teachers to select their own PD reading and form small groups to meet and discuss articles, book chapters, or view videos. Administrators need to participate, so they can strengthen their instructional leadership skills and understand the instructional paths teachers are embracing. 5. Watch Webinars & More. Step into the tech savvy world of PD. Sign up for free webinars or watch Tedtalks and online videos on Youtube and Teachertube. Negotiate a viewing deadline so groups can meet to discuss what they learned about instruction and supporting students. Try branching out beyond the walls of your school and schedule Skype sessions with teachers and administrators from schools within and outside of a district. 6. Meet to Discuss Students. If your school's focus is on student learning and progress, it's important to meet regularly to discuss students who are on a backwards slide. These meetings, so central to helping all students move forward, happen during the school day in a common planning period or a scheduled team or department meeting. By pooling knowledge about how to support students, several scaffolds usually emerge for teachers to try. 7. Take Online Classes. School districts and universities offer online classes that teachers can volunteer to take or districts can require teachers to participate. However, if a school requires staff to take an online class, then the district needs to foot the bill. A great advantage is that work for the class can be done at a time that's convenient for staff. Equally important is having discussions about the topic and how it affects teaching practices. 8. Coach, Support, Learn. Some states, like Maine, have a coaching culture and teachers receive support from highly skilled and continually trained men and women. Such continual support can bring about best-practice changes in how students learn. Don't be discouraged if your school doesn't have a literacy coach. A knowledgeable administrator or an experienced teacher that administrators free up by covering classes can wear the mantle of coach and offer guidance, conversations, and modeling to create change. 9. Try Teacher Walkthroughs. Engaging teachers in classroom walkthroughs, a role traditionally reserved for school administrators, can support professional development and contribute to school improvement. Walkthroughs are short and focused classroom observations followed up by a brief written report to the teacher being observed as well as a dialogue with the teacher about the observation. When administrators support this teacher-to-teacher strategy as positive learning, they foster shared inquiry and dialogue among teachers. 10. Support Teachers as Leaders. Instruction and student learning improve when administrators encourage teacher leadership and offer specific leadership tasks. Showcase teachers' strengths by inviting them to present workshops on professional days that tap into their expertise such as planning effective lessons, differentiating instruction and tasks, etc. Teacher leaders can organize and set the agenda for discussions about students, coach a colleague for part of the year, and recommend professional articles and books for colleagues to read and discuss. Professional development is the surest way to improving teacher practice and student learning. Advocate for PD in your building and nurture a community of learners who can sustain ongoing study and at the same time create a school culture that honors the five twenty-first century skills. For more on professional development, explore Laura's book: Redefining Staff Development, Heinemann, 2000. My doctoral work was focused on professional development, and I provide professional development as a consultant, so this question is dear to my heart. I think all teachers can list reasons professional development is bad: it's boring, not practical, not relevant, a one-shot deal, and it doesn't make a difference. But the real issue is that we don't do professional development effectively, even though we know what that looks like. In my dissertation, I studied schools and districts that won an award for their professional development, which included a proven positive impact on student achievement that could be linked to their efforts. There were seven characteristics of effective professional development: a clear purpose linked to research, student data, goals, and needs; accountability through classroom use of ideas and impact on students; development of a common, shared language; shared decision making which includes an emphasis on teacher input; incorporation of relevant, practical, hands-on activities; integration of opportunities for follow-up and application and strong leadership and a positive, collegial atmosphere. If you think about everything that is bad about professional development you have experienced, I'm guessing it didn't match these characteristics. Let's take what we do know and make our professional development as valuable as possible. Student learning is our ultimate goal in schooling. Students learn because of what they do - the courses they take, the selections they read, the assignments they complete, and the activities they engage in. Students do these things because of what their teachers do - the lessons they plan, the resources they select, and the time they allocate to certain learning goals. In my experience, most teacher PD is focused in one of those two spheres: a) the curriculum, materials, and structures that determine student activities, or b) the teaching approaches and strategies that lead to them. Though these are both necessary, neither truly hits the mark of offering deep, enduring, meaningful professional growth opportunities for educators. Standards change, curricula change, course descriptions change, and even the research on best-practices in instruction seems to shift beneath our feet. Have you ever noticed that no two research studies on high-yield instructional practices reveal the same list of teaching moves? It turns out that everything works, to an extent - they key is to implement the most effective strategy, based on the learning goals, the students' needs, and the particular context in which the work exists. This requires a third-level of teacher PD: we must build our teachers' ability to frequently, accurately, and deeply reflect upon their goals, practices, and outcomes. Because teachers only do what they do in their classrooms because of how they think about what they need to do. Rather than focus so narrowly on how to a) utilize a new tool (anything related to technology in the classroom, for example) or b) implement a new strategy (cooperative learning, for instance), let's emphasize the why. In researching and writing "Creating a Culture of Reflective Practice" (ASCD, 2017) with my professional partner Alisa Simeral, the influence of strong self-reflection has become a lighthouse in the professional-learning oceans. By building awareness of our instructional context (What are our goals? What tools do we have at our disposal? What are our students' needs and prior learning? ), engaging in deliberate thought (Which might be the best approach to meet our goals? ), intentionally assessing the impact of our actions (To what degree did this strategy yield success? ), and weighing our options in response (How might I adapt and adjust my approach to meet even more of my students' needs? ), we are much more likely to build the reflective capacity of our teachers...ensuring their success beyond any given initiative, strategy, implementation, or program. We all reflect on our professional responsibilities differently. We can grow our teachers by engaging in job-embedded professional learning that emphasizes self-reflection alongside whatever technical component of instruction (new materials, teaching strategies, etc.) is prioritized at that moment. By engaging in rich, ongoing reflection, we can build a teaching corps that is alert, intentional, aware, and responsive to the changing needs they face on a daily basis...and endures for their entire careers. We've made great strides in designing professional development for educators. The biggest problem that still remains, though, is the focus on the actual providing of the professional development, the facilitation, as all that matters. Let me set some context. In work that I currently do, and research I did for my recent book on the topic, I've learned that we can think of professional development as a process that encompasses three distinct steps. One, the facilitation of the learning, is the part that we tend to pay the most attention to, because it is the most visible. But, the parts that sandwich it, the planning at the start, and the follow-up at the end, are equally important. If we think about providing professional learning as a process, then we can understand why time must be spent in planning the learning (otherwise, what is the rationale), and following up on it (what is the point of growing or developing if there is an end point in reach). The cyclic nature of professional learning often isn't emphasized, which leads to one-off events which are akin to throwing spaghetti against the wall and seeing if it sticks; while some strands certainly will, most will likely fall to the floor, wasted. Along with valuing the cyclic nature of professional development, we also have to think about its audience. Building professional learning requires us to include the voice of those who will be involved in the learning, and it also requires us to make sure that the people in the room are the right people. We can't make this happen unless we take people's needs into account, and determine those needs from the people themselves. Paola Uccelli is Professor of Education at the Harvard Graduate School of Education. Her research in educational linguistics examines language and literacy development in monolingual and bilingual learners -in the U.S. and abroad-- and informs research-based pedagogies that seek to empower all learners' voices. Uccelli's research is featured in scholarly journals, such asJournal of Child Language, Applied Psycholinguistics, Reading Research Quarterly and Journal of Adolescent and Adult Literacy. One-day, one-size-fits-all professional learning (PL) workshops remain the most common format for supporting today's educators and school leaders to develop new pedagogical knowledge and instructional strategies and approaches. But this model is too low-intensity to actually make a difference; there are too few opportunities for active learning, application, and constructive feedback to bring about instructional change and improvement. The research base points clearly to the need to make wider use of new models of PL--those that are characterized by careful attention to building capacity among the individual participants while at the same time building the capacity of the collective. They ultimately foster enhanced core knowledge and instructional leadership among school-based teams. Yet few districts have committed the resources, both financial and human, to leverage what we know about improving literacy learning and teaching, and about school reform and leadership, to design and implement transformative PL. As a counter-example to the status quo, here we profile a 21st century literacy-focused PL initiative in one of the largest urban districts in the nation --New York State schools. For the last six years, we have worked together to design PL institutes, drawing inspiration from the Blueprint for English Language Learners' Success, an instructional guidance document focused on improving literacy rates among linguistically-diverse students. Action 2: Foster Collective Capacity to Implement Literacy Reform. Educators, coaches, school leaders and district-level administrators rarely participate in PL together, and are rarely supported to develop the relationships and collaborative structures needed to work together for effective school-level literacy reform. Therefore, our initiative was designed to support school teams that work collaboratively in sessions and at school sites. School leaders attended all sessions with team members and all group work was structured with learning and reflection protocols. Between each session, participants were asked to work as a team to connect content acquired in the prior session with data or initiatives at the school site, and to reflect on this process at the start of the next session. In addition, our sessions aimed to aid teams in 'messaging' the literacy reform initiative to colleagues at school sites. Because school faculty and staff are often balancing multiple initiatives (implementing a new teacher evaluation system, preparing for a new standards-aligned assessment, rolling out a new curriculum), we worked with teams to situate the institutes' reform principles within the context of initiatives already underway at their school sites. Aristotle said: "Educating the mind without educating the heart is no education at all." Sometimes I feel like our leaders miss this target when planning and facilitating professional development for educators. We are individuals. We learn differently from each other. We have feelings, thoughts and opinions. How come teachers have (so many!) horror stories about sitting through bland, Powerpoint-led, sit-and-get trainings during their professional development days? We wouldn't and shouldn't expect our students to tolerate this type of non-learning atmosphere. WHY would we apply different rules to our educators' learning experiences? 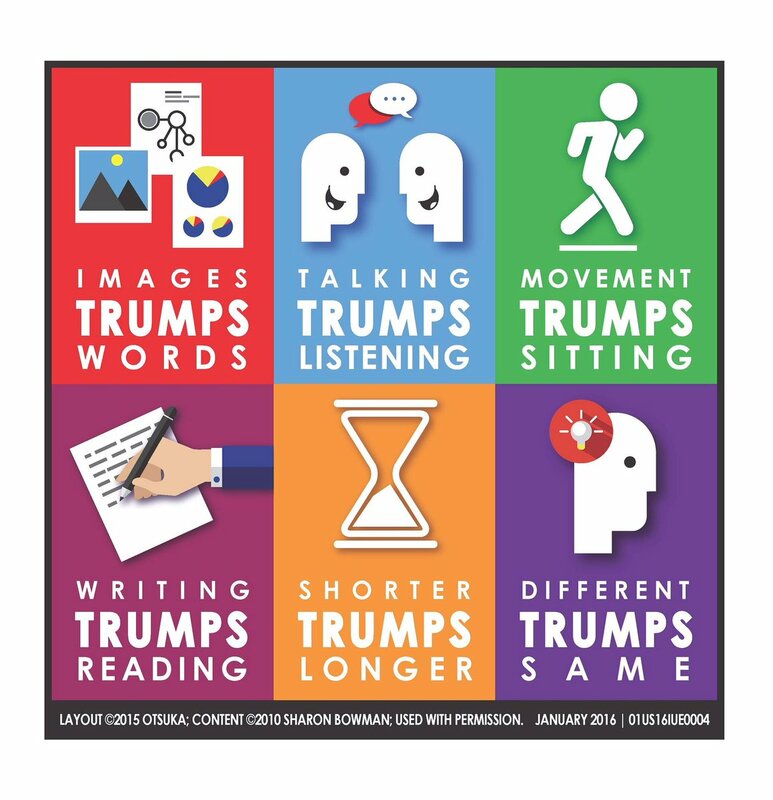 Consider the "6 Trumps of Learning" and ask your staff the following questions: Which of these are we doing well on? Which of these might need some work? There needs to be thoughtful consideration of the audience, their current teaching situations, the investment in the particular professional learning and avenue in which they can have a reflective voice. Here is a (re)design discussion protocol, Trudacot, that allows educators to think about, in this case, technology integration steeped in important disciplinary concepts. Design the learning experience with a low floor & high ceiling. Are the activities/processes going to challenge the audience but not overwhelm them? Are you considering those that might have prior knowledge of the information? Or those who might have less information than the majority (new teacher, substitute, etc.). Let's say you're facilitating a PD training on an education technology tool. Instead of standing in front of the group going through things step-by-step, grant them access to something like this They can start on any tab they feel comfortable with, in pairs/groups/individuals and they can go back at any time to pick up where they left off or access resources that are linked. A few kind words can elevate, inspire and foster a sense of belonging and nurture a learning environment. Start by spreading the love and creating a space for an appreciation wall...educators (...most humans!) like to hear when they are doing a good job. And when leaders showcase their educators, they get to witness those grins, eye twinkles and "Oh shucks." Who doesn't enjoy that?! Leading is hard, facilitating learning is maybe even harder but try to remember: "The whole is more than the sum of its parts." Another fantastic (and very true) quote from the wise Aristotle. I love when given a new idea but for some reason we are never given the TIME to implement the new ideas learned during professional development days. Practical use in the classroom . Ts need automatic strategies that can be taken back to classrooms. If they aren't practical, they aren't going to use them. Differentiation. Teachers differentiate for their students' abilities-that's just good teaching. Yet, PD doesn't do that. Differentiating for teachers' abilities supports teacher practice & builds efficacy. @Larryferlazzo, happy to write article for @EdWeekTeacher on this topic! I think one struggle we all face with professional development is mindset. Even when it comes to fairly interesting/exciting PD opportunities sometimes we, or our colleagues, go into PD with a negative mindset and I believe that affects PD impact. In the end we get what we give. Thanks to PJ, Laura, Barbara, Pete, Fred, Emily, Paola, Nonie and Meredith, and to readers, for their contributions!